The NX300 becomes the new flagship model in Samsung's NX series and arrives three days before the start of the Consumer Electronics Show (CES). UPDATE: To view our Samsung NX300 image sample gallery, click here. Samsung has broadened its NX-series a few days before CES with the announcement of the NX300. Claimed to be the new flagship compact system camera in the company’s range, the NX300 features an entirely new 20.3MP APS-C sized sensor and provides a 100-25600 ISO range. As well as its new sensor, the NX300 features a new Hybrid Auto Focus system that’s never been seen before. Designed to deliver fast and accurate phase and contrast detection, the camera can shoot at a maximum 1/6000sec shutter speed and offers the ability to shoot a continuous burst at a breathtaking 8.6fps. This is made possible thanks to the inclusion of a DRIMe IV image engine processor, which also adds support for full 1080p HD video capture in both 2D and 3D (when coupled with Samsung’s latest 45mm 2D/3D lens). At the rear there’s a 3.3in, 768k-dot AMOLED display. This is the tilt type to make it easier to shoot from high and low angles. As well as a Smart mode that allows users to choose from 14 different settings, such as Creative Shot, Landscape, Light Trace or Action Freeze, there’s an i-Depth feature that enables users to modify camera parameters using the lens itself, adjusting the image without ever having to move off target. The NX300 also supports Wi-Fi connectivity. Users will first be required to download Samsung’s Smart Camera App, which is available for both Android and iOS based devices. The NX300 will be able to detect and auto-connect to the smartphone wirelessly whenever any of the Smart Camera features are activated. Adding to this, the Smart Camera App also features a remote viewfinder function to control the camera wirelessly from distance. At this present time there’s no information on pricing and availability, however we’re expecting to find out a lot more information about the camera at the official unveiling next week at CES 2013. 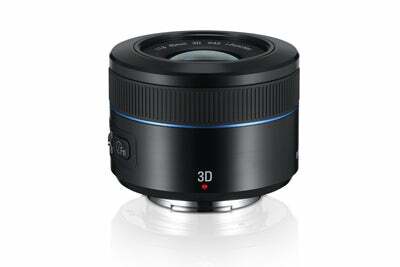 At the same time as announcing the NX300, Samsung has released the 45mm f/1.8 2D/3D lens. The latest optic features a construction that’s made up of 7 elements in 6 groups and has a 50cm minimum focusing distance. With a 43mm thread at the front for attaching filters and accessories, the new lens weighs 115g but doesn’t support Samsung’s optical image stabilisation (OIS) technology. We’re expecting to lay hands on the new NX300 and 45mm f/1.8 2D/3D lens at CES 2013, so check back to our image sample gallery for the very latest image uploads.